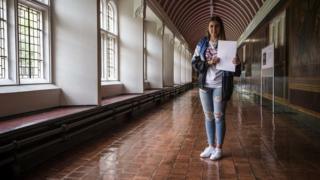 A teenager who sat her chemistry GCSE the day after she escaped from the Grenfell Tower fire has been awarded an A grade in the subject. Ines Alves, who lived on the 13th floor, fled the blazing block holding her chemistry notes and sat the exam in the clothes she left in. Speaking at her school in Hammersmith, the 16-year-old said she was "quite happy" with her grades. She also gained top marks in maths and Spanish. The teenager now plans to study chemistry, maths, economics and sociology when she starts her A-levels later this year. 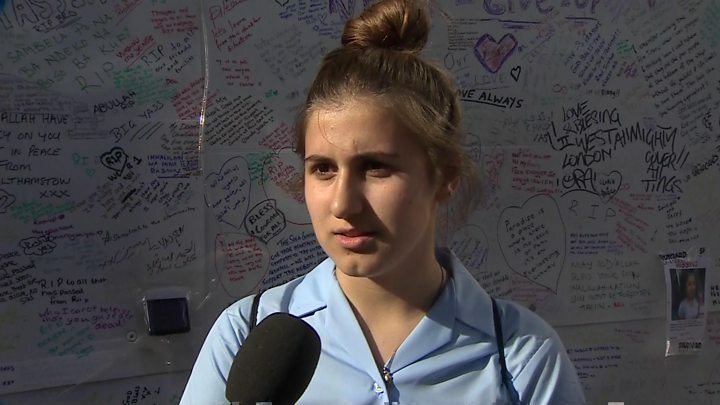 In the days after the fire, Ines missed exams in history, RE and physics which has affected her overall grades. "I wish I did more, but then again, I don't know... For the exams I missed, I didn't do too well in them overall [the subjects]," she said. Sacred Heart High School headteacher Marian Doyle called her results "fantastic". "It must have been so hard for her to actually come in and do that and try to blot out the scenes of what she had seen," she said. Ines said she sat her chemistry paper that morning as "there was no point me carrying on watching the building burning". Her family are currently living in a hotel as they wait to be offered a permanent home. Her 20-year-old brother Tiago, who joined her to collect her grades, said he was "very proud" of his "overachiever" sister. "It seems very surreal even though I knew she was going to get it," he said.